Hypothetical question: If I move into a tiny house and someone steals it while I'm living in it, does that count as theft and kidnapping? I was just watching a feature on the local news about a family here that was on an episode of Tiny House Nation. I had already seen their episode but I was amused by how over the top the reporters were reacting to the idea of living in a tiny house. 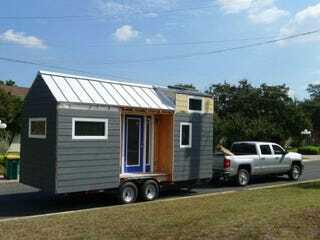 It's a house, just smaller and a ton more efficient than regular houses! Not all of us need tons of space to be happy! But then they followed it up with this story and I got sad. Seriously, someone builds a tiny house they plan on putting their entire lives in and someone else has to go and steal it? It didn't even strike me until they showed an interview clip that the house that was stolen belonged to Casey Friday, who I had been following on youtube to watch the progress on his transition into tiny living after stumbling on one of his washer/dryer reviews (I know my life sounds thrilling). He wrote this post about how the amount of drama around his construction and now the theft has him rethinking moving into a tiny house now and it just bums me out bigtime.